A small army of security guards assembled at the company’s Altona plant, ahead of the annual address by Toyota Australia president Max Yasuda on Monday afternoon. They were told of Toyota's decision to end local manufacturing in 2017, with an estimated 2500 manufacturing workers will lose their jobs at Toyota's Altona plant. In less than 12 months all three of Australia's car manufacturers - Ford, Holden and now Toyota - have pulled the pin on the local industry. "This means that local manufacturing of the Camry, Camry Hybrid and Aurion vehicles, as well as the production of four cylinder engines, will cease by the end of 2017." "The decision was not based on any single factor. The market and economic factors contributing to the decision include the unfavourable Australian dollar that makes exports unviable, high costs of manufacturing and low economies of scale for our vehicle production and local supplier base," the statement says. 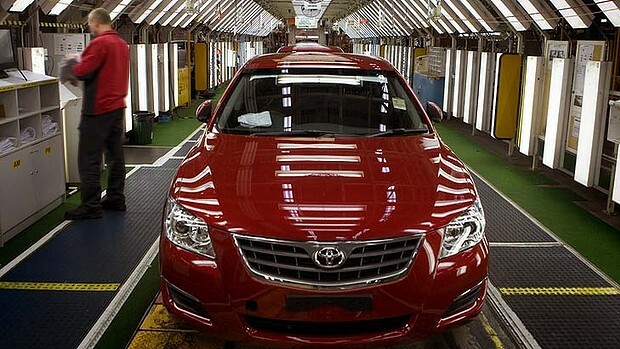 Toyota Australia chief executive Max Yasuda said the company had done everything it could to transform its business. Mr Smith said the government was ‘‘chasing important and viable operations out of Australia. This is serious injections of foreign capital we are waving goodbye to across the manufacturing sector’’. Toyota has consistently stated it needs to cuts to labour costs are part of an overall move to reduce production costs per car by $3800 by 2018 and keep the car maker in Australia. Absolute disgrace. Ford , Holden now Toyota. All these poor buggers with no jobs coming. All quality built cars being replaced with import korean and chineese garbage. NO Australians would buy the local cars and anyway, all of these large companies couldn't give a damn, they got their money and now, like rats, they are leaving the sinking ship. I am glad that the federal Gov didn't bail ANY of the bastards and I CANNOT see why Australians couldn't build our OWN car? We DON'T need them or their money, we could be self sufficient and could have entrepreneurs to back the whole deal. First and foremost, we NEED to stop selling our home to the person with the most dollars and try to become overnight millionaires and then, we need to start taking pride in OUR achievements and BUY Australian. EVERYTIME we buy the OS goods we are keeping someone overseas in a job. I DO NOT buy the s**t that Australians get paid too much, but I am saying that corporations look after the TOP END of their businesses and forget the rest, look at banks, since when did a CEO deserve + $12 million a year?? I will have to stop or I will write a short story. Imagine how many others will face retrenchment....makers of electrical components( altenators, coils, leads, wiring, switches), a/c parts ( condencers, piping, compressors, pulleys, brackets), fan belts, brakes, suspension, steering, wheels, exhausts, fastners, cloth and the like for interiors....etc......it will surely have a ripple/flow-on effect to the suppliers of the products that go into making a car. We're in for a painful ride. When CEOs are paid for doing a bad job, you know there's something wrong with the world. The constant demand of the shareholder for the company to grow and keep growing is what has driven the chase for the cheapest labour.